The year is drawing to a close, and gamers are counting the number of games they’re getting in their holiday packages. But which game dominated the charts in 2015 and which were the best selling games? Steam Spy creator Sergey Galyonkin seeks to provide an (approximate) answer, based on some good ol’ Steam stats. 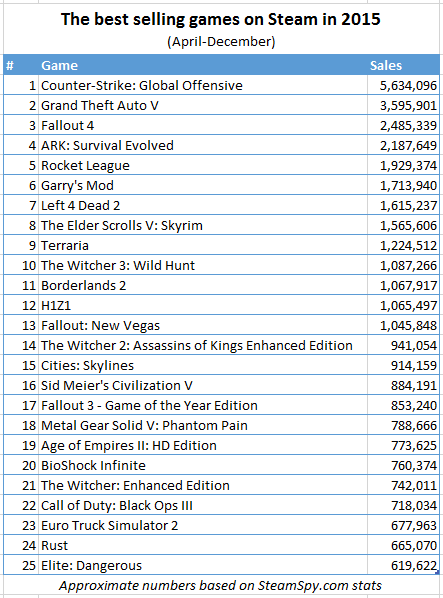 The massive GTA V leads the pack, with 3.6 million copies sold, followed by Fallout 4 (~2.5 million), Ark: Survival Evolved (~2.2 million), H1Z1 (~2 million), and Rocket League (~`1.9 million) to round out the top 5. There’s a few surprises in here; several indie titles out-performing popular AAA games. However, Sergey himself notes that these are only preliminary results and don’t include sales from January, February and the ongoing Steam Winter Sale, with a promise to update a more comprehensive list in January next year. Are your favourites on the list? Which entrant took you most by surprise? Comment away! Previous articleWhere Are The Gamers In The Indian Game Industry?